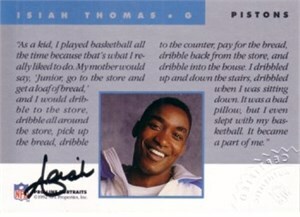 1992 NFL Pro Line certified autograph card of former Detroit Pistons superstar Isiah Thomas (first name only). Embossed with the NFL's seal of authenticity. With certificate of authenticity from AutographsForSale.com.